Let’s admit it – the mehendi ceremony is one of the most fun events at a wedding, with its playful vibe, fun activities and festive ambience. From the ornate henna patterns to the haute styles that a bride can flaunt, the mehendi function is made for picture-perfect poses and memorable moments. 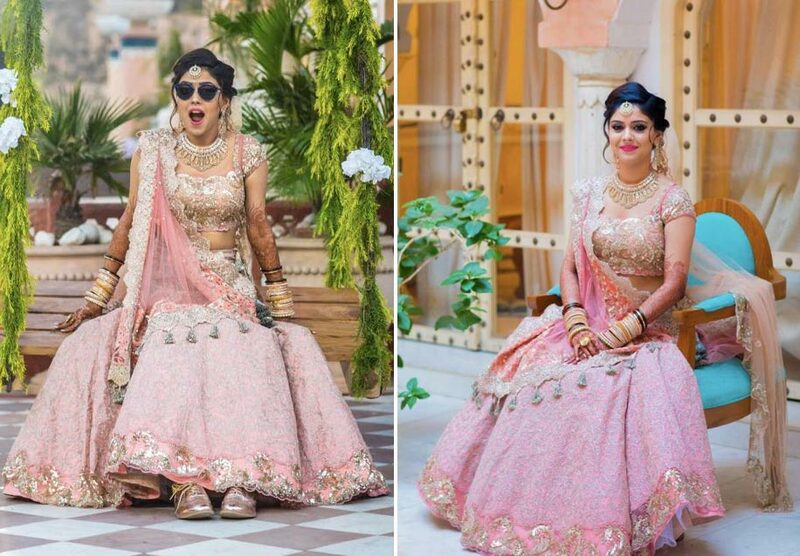 Wondering what to wear at your mehendi? 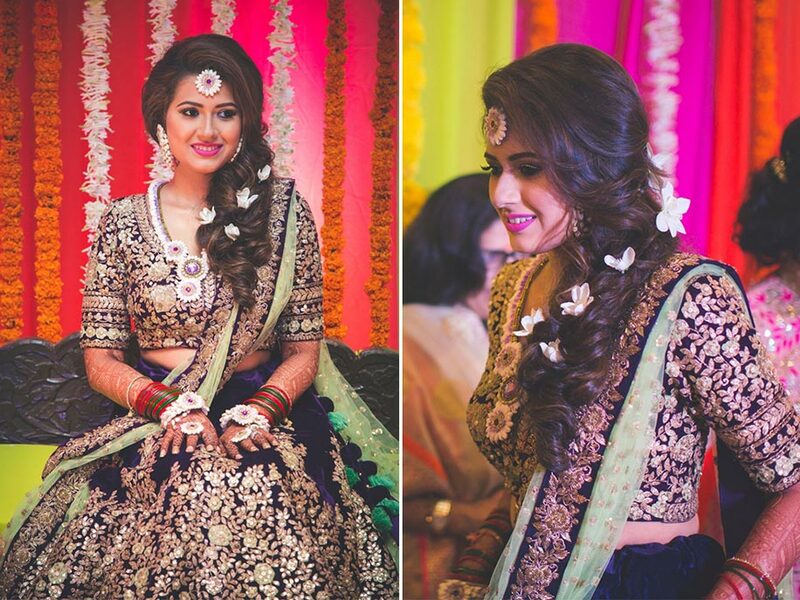 Check out our pick of trending lehengas worn by real brides that are bound to turn heads. Want something girly yet gorgeous? 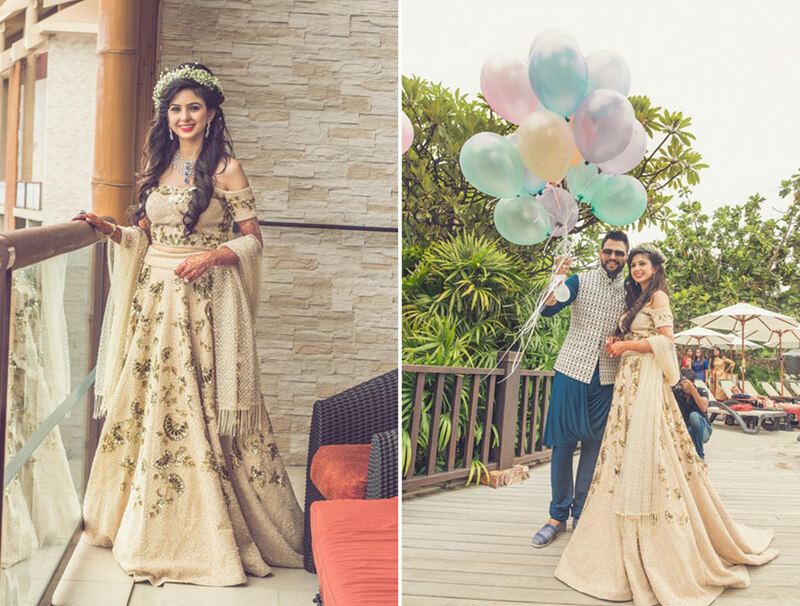 The fairytale princess look gets an ethnic makeover with this bright floral print lehenga by Anushree Reddy with an off-shoulder blouse. 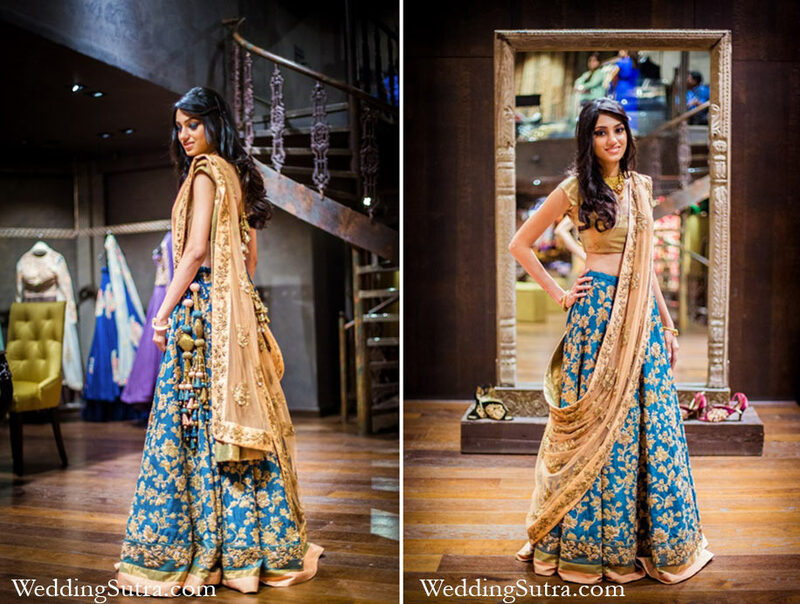 It is ideal for a bride who wants to look like modern royalty as she twirls around at her mehendi party. 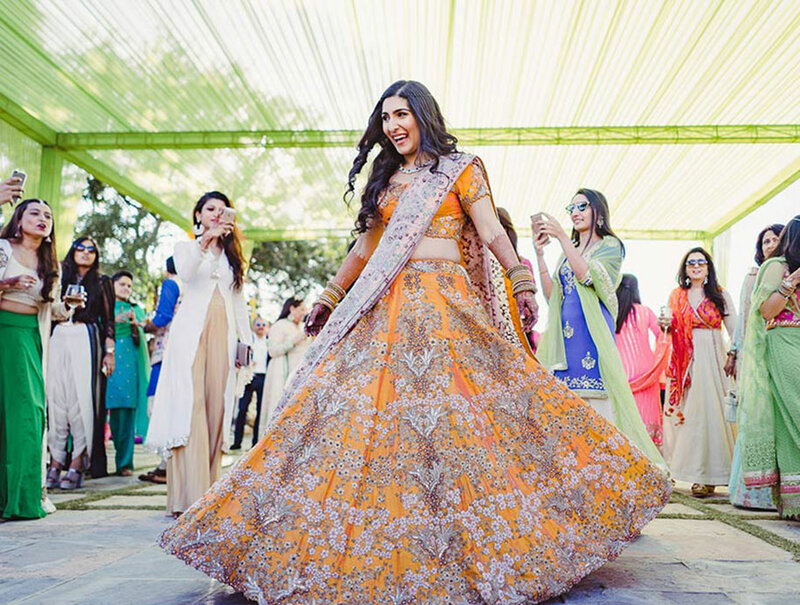 Warm, buttery layers interspersed with a dull gold hem and pretty motifs make this lightweight lehenga a charming choice for that summery outdoor mehendi do. Pair it with jewelry that is as light as the net dupatta – you really don’t need anything else. 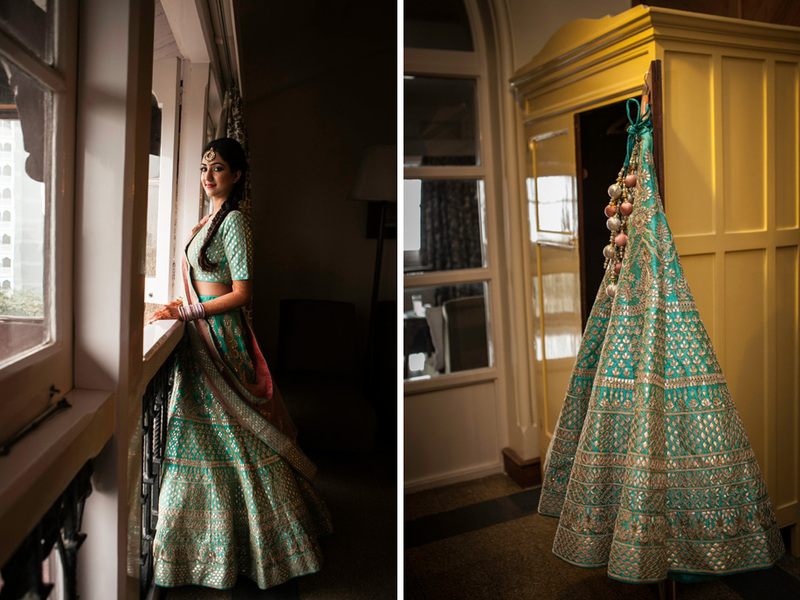 Teal and beige may be contrasting hues on the color wheel, but they blend magically together in this lehenga Shyamal and Bhumika that is adorned with cute tassels at the waist. A beige dupatta with an embroidered border and matching blouse complete the look. Designer Sabyasachi Mukherjee uses regal deep purple and pastel mint green in this ensemble which is striking thanks to the unusual color pairing. With all-over gold embroidery, this lehenga will make you look and feel unique. Featuring minimal embroidery on the skirt and dupatta, this lehenga plays around with two primary colors for that eye-catching and elegant effect. The beautiful luster and rustle of the sunny silk skirt will add shine to your mehendi bash. Inspired by beautiful Mughal patterns, this Gulrukh print lehenga by Anita Dongre is light and breezy with its multitude of patterns, short-sleeved blouse and dupatta. Think exotic princess meets modern stylista – that’s the vibe of this lightweight beauty. The beauty of an all-beige ensemble is that it offers a powerful canvas against which striking accents really stand out. This lehenga with embroidered embellishments, an off-shoulder blouse and plain dupatta exudes exquisite earthy elegance. Nothing spells cheer as much as the blues in this Manish Arora ensemble that is lit with baroque embroidery and pink circular motifs. Paired with a funky blouse resplendent with applique hearts, this lehenga ups the quirk factor in a cool way. 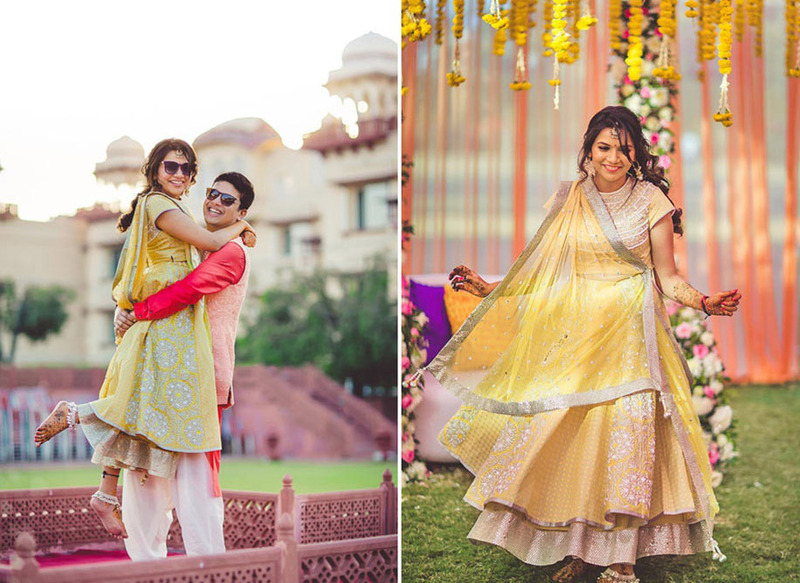 Yellow and pink are traditional festive colors at Indian weddings, and they work wonderfully in this yellow lehenga by Manish Malhotra with pink accents. 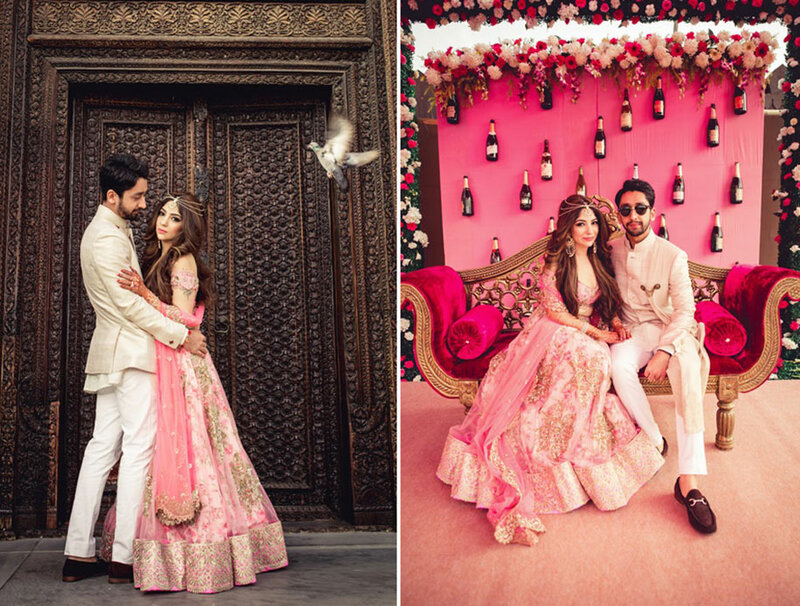 From the glittery bands of pink and silver at the hem to the border on the net dupatta, everything is designed in tandem and pair perfectly – like a ‘match made in heaven’ couple. 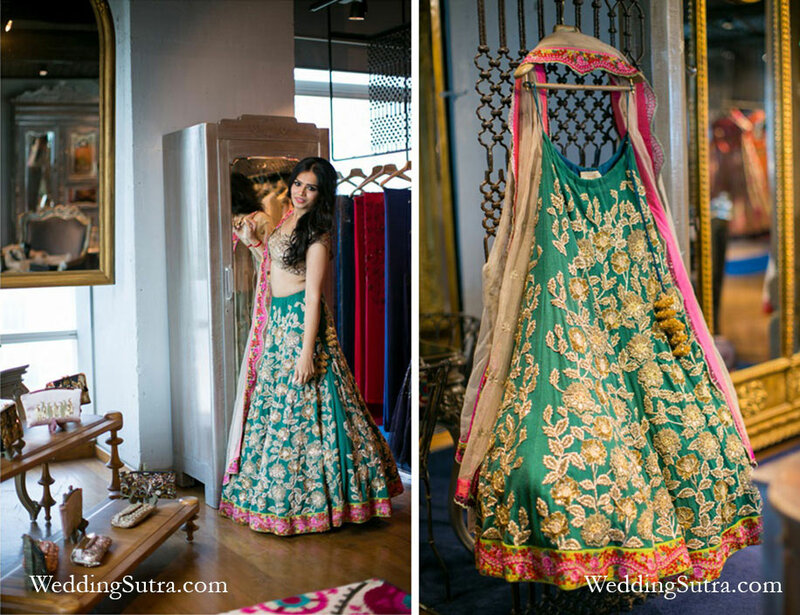 This Jade lehenga blends teal with gold threadwork and pink touches. The unusual green colour proves an ideal base for the all-over floral embroidery, and while the beige and pink dupatta provides a festive touch. Girlish and charming, his pretty shell pink lehenga by JADE has a beautiful embroidered hem, embellished blouse and a matching net dupatta with pretty tassels. It’s perfect for those impromptu dance moves that spell fun. 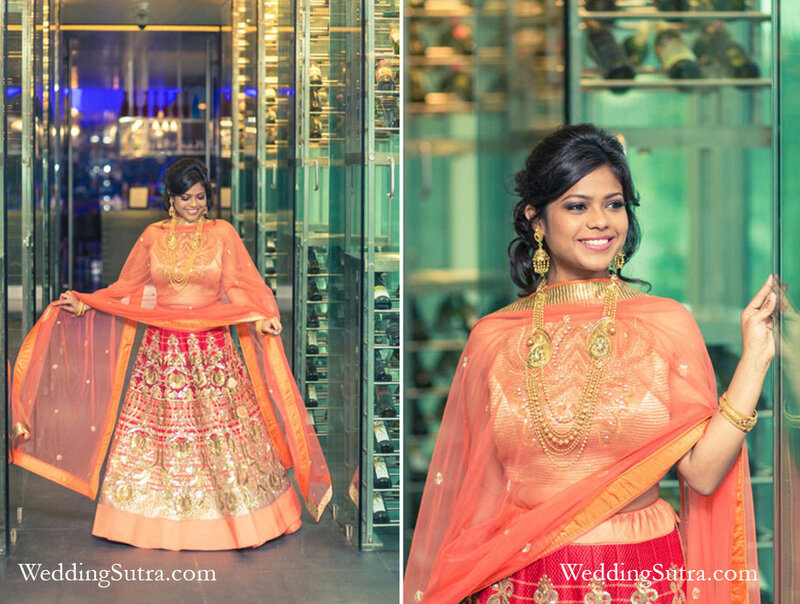 Orange and red pair beautifully in this lehenga by JADE and imparts an authentic traditional vibe to the bride’s look. You can never go wrong with this colour combination and the beautiful gold threadwork adds an ornate edge to the whole ensemble. 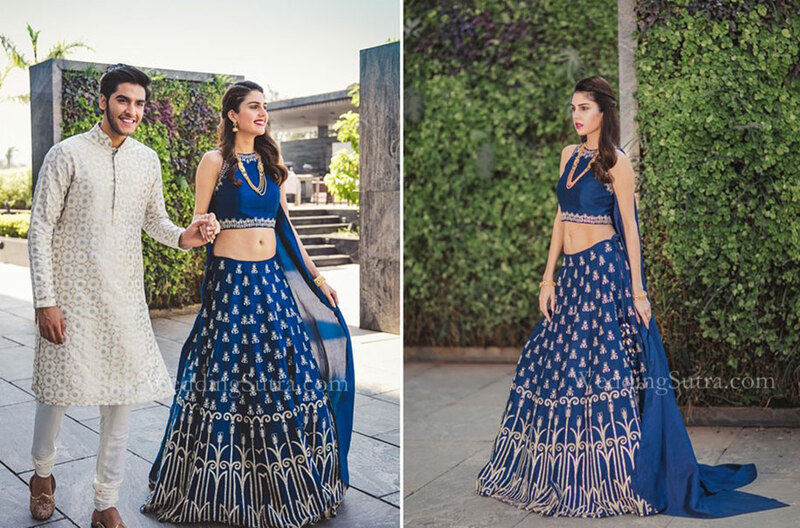 This blue and off-white silk and organza lehenga by JADE with intricate embroidery may be an unconventional pick for a mehendi – but if you want to totally stand out, just pick this serene number for your mehendi bash. 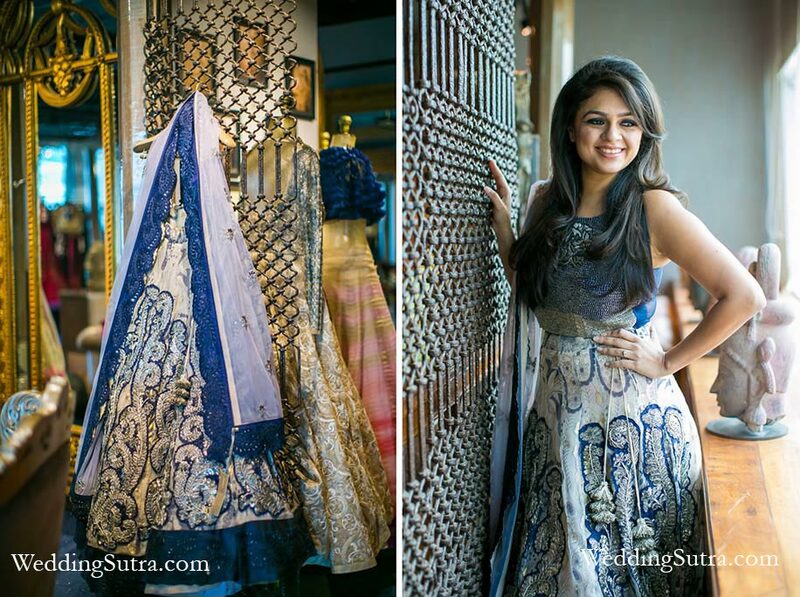 This pretty midnight blue cape choli lehenga by SVA Couture is just what you need to create a dramatic impression. With delicate and pretty motifs, you are bound like no less than a diva on your mehendi. 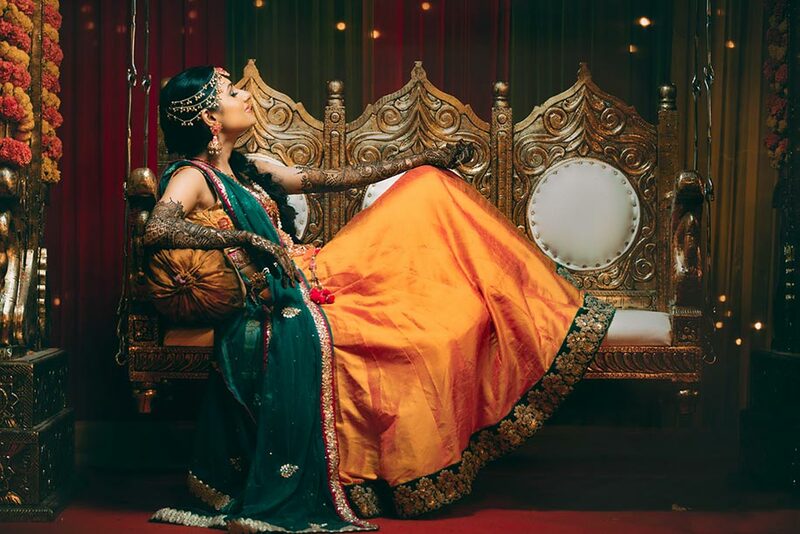 This turquoise lehenga features beautiful tassels alongside embroidered ‘gota pati’ motifs, and is paired with a peach dupatta. This ensemble spells glamour all through and makes for a picture-perfect mehendi outfit. Mauve and yellow make for an unusual pairing and work wonderfully in this Anamika Khanna lehenga. With pretty sequins and a light lavender dupatta, this sunny number will make any bride glow. 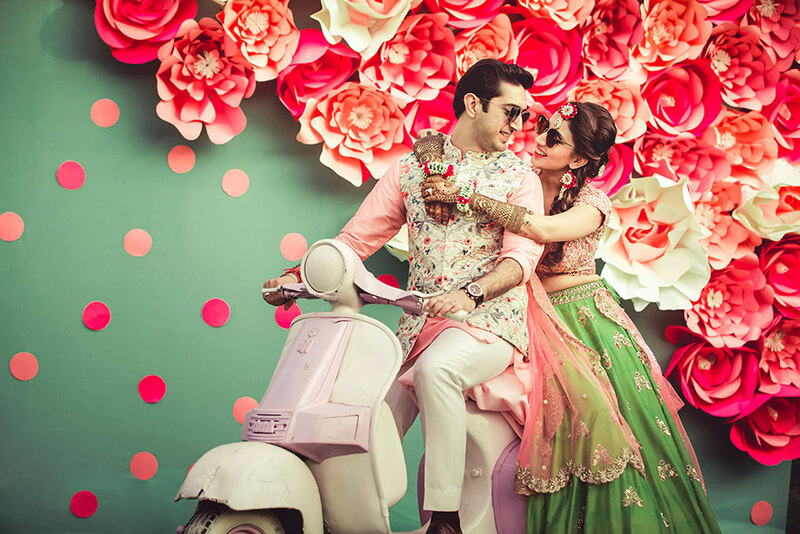 Green and pink ensembles are popular for mehendi functions, and the best part is that the variations of these colours lend themselves to endless pairings. 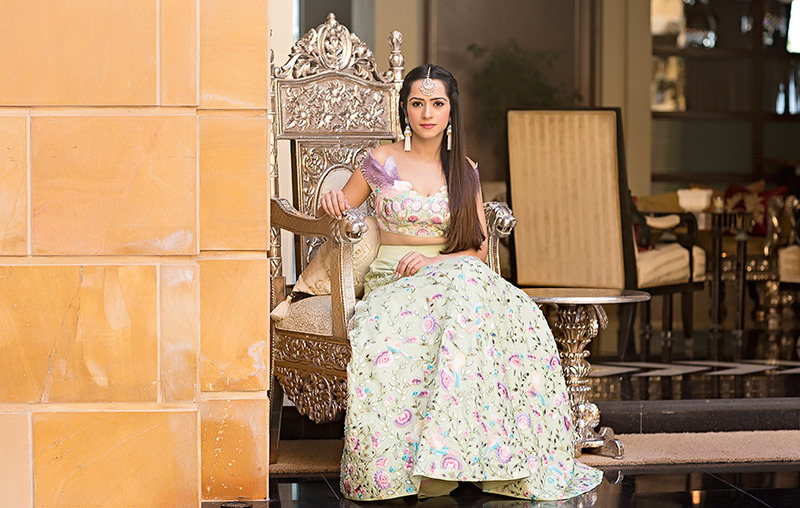 This blush green lehenga by Anushree Reddy is playful and lightweight, and the net dupatta adds that extra festive flair. If you fancy bright colors and are not afraid to flaunt bolder silhouettes, this ultra-mod ensemble by Monisha Jaising is perfect for you! It’s bohemian, versatile and oh-so-cool with a white blouse, pretty dupatta with green lace border and shiny motifs, and a floral print skirt. This pastel green organza lehenga by Koesch is covered in multi-colored pastel birds and floral vines embellished with laser-cut mirror work. These intricate details will impress all and make you look like a sartorial sensation. 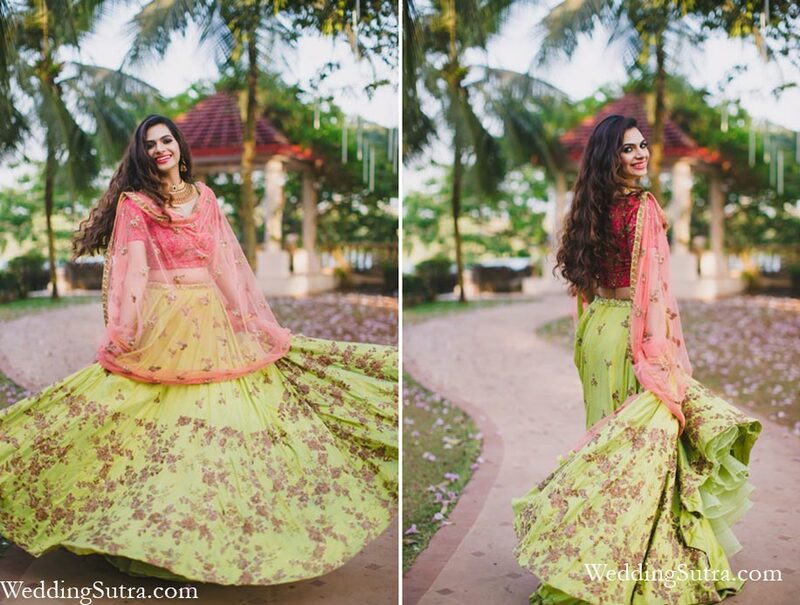 New-age brides-to-be will love this lemon green and pink lehenga by Shyamal & Bhumika. Everything spells frilly, flouncy and fresh with its interesting color pairing and lightweight feel.